We have received many requests from artists for an extension of the final submission deadline, so we are officially moving it to the end of July 2015. We are excited to announce we have a NEW SPONSOR in the LightWave Spring Into Summer Challenge!!!! Render4You Renderfarm is offering 250 credits (worth 35 € or approximately $38) to each artist that submits a final entry (or entries) in the LightWave Spring into Summer Challenge! The LightWave 3D Group has launched a new design challenge that offers a treasure trove of terrific prizes for the winners! LightWave 3D artists will have the opportunity to participate and win in two design areas - ART and ARCHVIZ. The caveat is that all entries must incorporate Mechanical Spring objects into their designs to qualify and be entered in the challenge. There are no limitations to your designs. Use your imagination, be really outrageous or magnificiently realistic. Just make sure you create your design in LightWave 3D and add "Springs" to the design. We offer many thanks to Peter Thiersch at rendering.de for all his help in getting this challenge launched! We encourage you to share your Works in Progress (WIPs) with the LightWave 3D Contest page on Facebook as the challenge unfolds. All final entries must be posted to the LightWave 3D Contest page on Facebook before the 11:59 pm (PST) deadline on June 30, 2015. PLEASE NOTE: The deadline has been extended to 11:59 pm (PST) JULY 31, 2015. There will be three prizes awarded to winners in each category of ART and ARCHVIZ, with a special prize being awarded in each category to the image that receives the most LIKES on the LightWave 3D Contest Facebook page . Below are the many prizes from our generous sponsors of the Spring into Summer Challenge. Be sure to read THE RULES and THE FINE PRINT at the bottom of the page, and let the challenge begin! 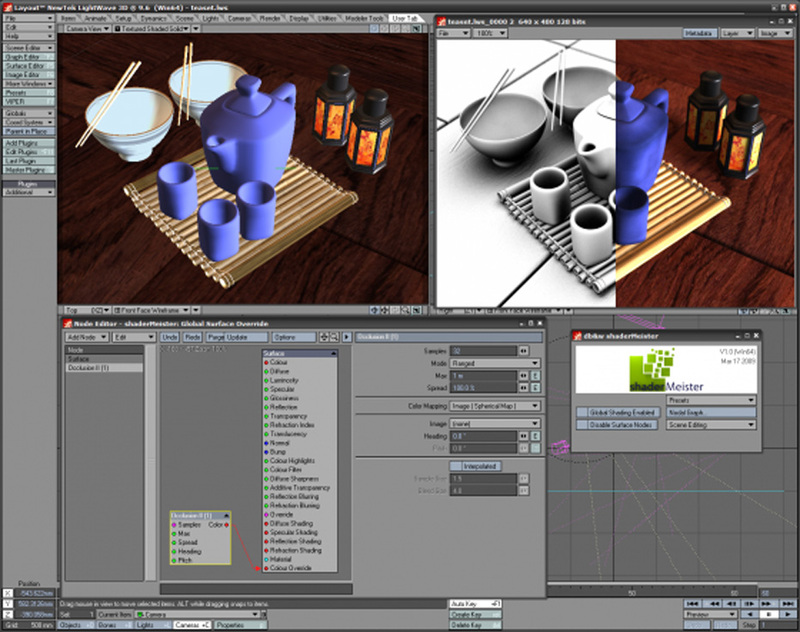 Learn more about LightWave 2015 here. Learn more about ChronoSculpt here. Learn more about NevronMotion here. Learn more about the 3rd Powers Complete Tool Pack here. One of the many plugins being offered includes LWBrush (featured below). Winners will receive the Full Tools Set, which ihcludes LW Brush, Cage Deformer Lattice Deformer, Meta Mesh, Boolean Tool and Heat Shrink Plus. Discover the features of Volumedic CE here and see how the volumedic rendering tools in the Volumedics plugin can boost your creativity . Learn how this new plugin can boost your modeling capabilities with a lattice tool, an edge slider and a sketch drag tool. Learn more about Tool Chefs here. shaderMeister (image below) allows you to override the shading of surface on a scene by scene basis. This is accomplished by a shader plugin that is applied to all surfaces that should be overridden by shaderMeister. When rendering, the shader plugin will detect if a shaderMeister global shading network is present and then evaluate it. The shaderMeister global shading network itself is saved with the scene. A master handler plugin manages it. Once you have applied the shader to all surfaces in your current scene (which only needs to happen once and is automated by shaderMeister) you can thus override the surfacing on a scene by scene basis. exrTrader is a suite of plugins and provides complete support forOpenEXR in LightWave 3D. It includes free standard image loaders and savers supporting RGBA as well as an image filter plugin to save arbitrary buffers. OpenEXR is an HDR image file format featuring support for 16/32bit float and 32-bit integer pixels, multiple lossless compression schemes, support by all major compositing packages, and storage of multiple, arbitrary channels in a single file. - Participating artists must create original, unpublished work in LightWave 3D software and include Mechanical Springs as objects in their design. - Artists are encouraged to post works in progress (WIPs) of their designs for community feedback to the LightWave 3D Contest page on Facebook. - A final photo library of the ART and ARCHVIZ image submissions will be posted on the LightWave 3D Contest Facebook page once the challenge is concluded. There, visitors of the LightWave 3D Contest Facebook page will be encouraged to LIKE their favorite images. The ART and ARCHVIZ images with the most likes, will receive the MOST LIKES Prize in their respective category. - Three winners will be selected in each category directly by the LightWave 3D Group. The Special MOST LIKES Prize will be awarded to one artist in each category who receives the most LIKES on the LightWave 3D Contest Facebook page. The images posted in the final image album following the contest may be shared around Facebook, the Web and other social media sites, but any LIKES these images receive outside the LightWave 3D Contest Facebook page will not be included or considered in the final tally. - Participants may submit entries into both the ART and ARCHVIZ categories, but are eligible to win in only one category. Your image submission to the LightWave Spring into Summer Challenge on the LightWave 3D Contest page on Facebook, grants NewTek, Inc. and its representatives and agents the right, on a nonexclusive worldwide basis, to utilize, copy, duplicate, distribute, modify and display the content that you are providing to NewTek, in the manner NewTek determines in relation to NewTek’s Product sale, distribution, marketing (including trade shows and Internet), and development. This consent may not be revoked, and extends to NewTek and its customers, distributors, designees and assignees of NewTek perpetually (or so long as allowed by law, but not less than 20 years). NewTek's use of the content submitted requires no further consent from you nor requires payment to you. By uploading an image you warrant and agree that you are the original creator and own the copyright to the image you submit, and that your submitting the image does not violate or conflict with the rights of any others in the image. You further warrant that all or a significant percentage of the image was created with LightWave 3D Software. NewTek, Inc. cannot be responsible for data loss and we reserve the right to include or exclude images without further explanation. Please be sure to backup and maintain all images that you submit. You retain all ownership rights to the image(s) submitted.